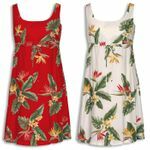 Bird of Paradise Display Plus Size Women's Aloha Short Sleeve Long Camp Shirt is Available in Black. RJC Brand - Puanani Label maker's of Quality Made in Hawaii Women's Rayon Clothing since 1953. There are no universal size standards in the apparel business. One manufacturer’s large is another manufacturer’s medium, etc. These measurements, shown in inches, on this size chart, pertain to R. J. Clancey Rayon Camp Shirts, and have no relationship to any other shirt style, maker or brand name. 1-866-628-4626 (1-866-MAUIMAN). CLICK to see Local Maui Time: Maui Time. BUST: The measurement is the circumference measurement taken from the armpit seam to armpite seam. LENGTH: Straight measurement taken from the back, top center, of the Shirt to the bottom hem.